In an ever changing technological environment, our generation has become particularly reliant on technology and instantaneousness. We expect everything on a plate for us; every text to be replied to, every tweet re-tweeted and every instagram post liked. It seems as though we have developed so far into a technological sub-universe and stopped really living! I recall a recent event at which I was in the audience of a traditional moroccan show; a varied mix of the country's traditional culture. For the first half I was captivated; by the beautiful belly dancer, traditional war horses and their battle dances and wonderful acrobats performing acts that I couldn't even begin to wrap my head around. That's when I decided to turn and look at the audience. Apparently not everybody was enjoying the wonderful show as much, or at least it that's the way it seemed. For rows and rows, all I could see were iPhones. It baffles me how people would rather be living through their screens rather than actually experiencing their surroundings, taking in the culture and reveling in the wonders that the world has to offer. This was not the first time that recent technology's role in our everyday life had surprised and shocked me. A year ago I had gone to watch a family friend perform in a local pantomime of a modernised Peter Pan. She had landed the starring role of 'Essex Tinkerbell'. The show was hilarious, brilliant and fun for all ages. However the family in the row in front didn't quite seem to think so. They were probably also along to see a family or friend, and had a young child of not even two years old with them. The child quickly grew bored of the pantomime and began to whine. In response the parents gave their child an iPad to play on (full volume and all, completely disruptive and dismissive of the rest of the audience's discomfort.) Bare in mind, this child was only maybe two years old and already completely dependant on technology, am I the only one that finds this terrifying? It's almost as if the entertainment provided that evening, was not quite entertainment enough. In a recent bid to relocate the luxury of experience, singer Kate Bush asked the audience at one of her shows not to use filming or photo equipment and simply enjoy the performance. This was so that the audience could fully interact with their surroundings and appreciate what was going on around them! Low and behold, the audience actually respected Bush enough to put down the phones and watch her perform. I miss the times when we just were. We didn't have to document every second of our lives on phones and facebook. Experiences were just as they happened, unobscured by the disruptions of technology. It scares me that we are becoming so detached from society. Every day, real, true life experiences always seem to be accompanied by selfies or at least one member of the party checking their text messages. The other day I went to see a friend that I had not seen in a while. We had a lot to catch up on, yet the entire time she was on her phone, replying to texts or checking her twitter. Whenever I go for a meal with friends, the phone is always right there, right next to the cutlery. As if the person that might call or text has that person's priority. Usually, unless urgent I don't reply to texts unless I get a full on opportunity to. I also get ridiculed for not replying to texts straight away. Sometimes, I don't look at my phone, for hours. Sometimes I'm in the bath, out with a friend, having a meal, watching a movie, and I don't reply. People find this unusual. 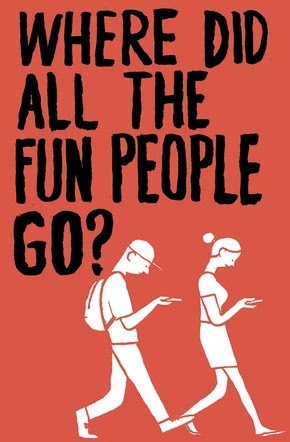 As if god forbid, for a few hours we might not be glued to our phones. My mother, an intelligent woman has faith that one day soon the human race will get bored of technology, that real life experiences will start becoming 'the thing' and overtake as our main form of time consumption. She backs this up with the arrival of websites such as 'meet up' which combine the current technological state with meeting up and ~*doing things~*. I really hope that she's right. Of course there are great advantages to technology too. Not just the lifesaving medical equipment developed in recent years or the access to educational resources that without technology would not be accessible, but even closer to home. Running this blog for example, this blog gives me a platform to express my views and be heard by others, facebook provides a place to share photos and memories with people you know, and keep in touch with those you may not have contact with otherwise, and twitter is a great place where you can follow the views of your idols. Without the internet and modern technology, many people would perhaps be less educated. It is so wonderful how technology can shine light on once 'taboo' or unspoken topics, broaden peoples minds and opinions and spark debates. I do think technology is a wonderful thing, perhaps all that needs to change is the way that we use it and remember to value real life experiences in a more hands-on way. What do you think? Are trips to the theatre and museums in and selfies out? Lets start enjoying life for what it is, completely beautiful, unadulterated experiences. I hope you enjoyed this post (sorry it was a it ranty) please follow me on bloglovin! Amazing post! This is so true. Its going to be interesting to see what the future holds when it comes to technology and the influence it has on culture and future generations, scary thought.